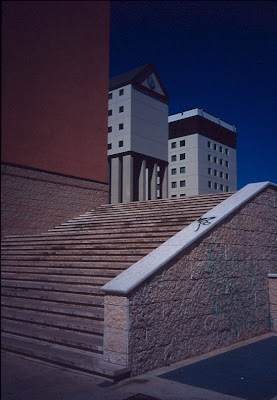 As yet incomplete, Aldo Rossi’s project consisted of a broletto or public building, a residential block, a theatre building and a commercial block arranged around a piazza which spans over the road connecting to the station. 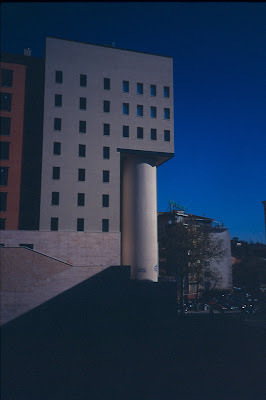 The decision to accommodate car parking as a basement deck allowed for a new ground plane to be established which would be free of traffic, but followed the sloping terrain typical of traditional piazze in the region, such as Piazza IV Novembre in the same city. But far from integrating itself into the dramatic topography of Perugia, the new piazza sought to re-establish the centre at a lower and more accessible altitude, even to the extent of imitating the positioning of the individual elements of the city core. So as the piazza rises, the centrally placed fountain is flanked on the left by a public building and on the right by the dense urban wall or residential element, with the as yet to be constructed theatre closing the progression. This apparent contextualism is subverted by the realisation that the ground on which the new piazza stands is an artificial topography, the ‘authenticity’ of the plan form, its historical grounding, not extending to the section. The individuality of the elements that Rossi designed for Fontivegge suggests that his analysis of traditional urban forms found expression in the design of the new urban components yet, as he had asserted in 1966, an imitation of these forms would not itself ensure success. 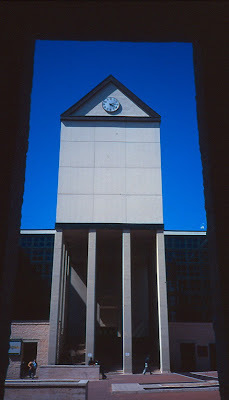 His new buildings are dumb structures awaiting the accretion of meaning which only the layering of history can provide. 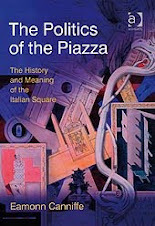 In the meantime the vacancy of their forms requires appropriation by the citizens whose attitude is one of apparent indifference to the surroundings, or at least a complete acceptance of them as organic parts of their lives, the buildings and piazza providing the surfaces against which daily and ritual activities are set.